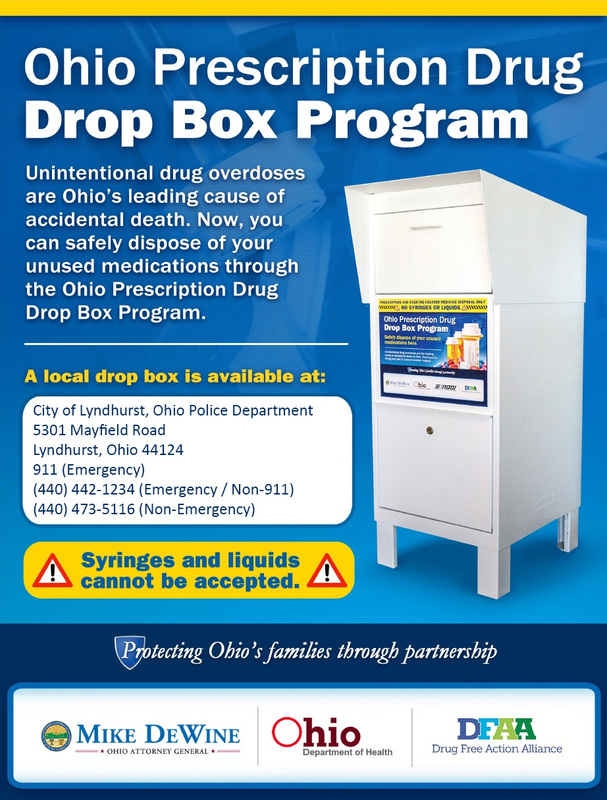 The City of Lyndhurst, Ohio is participating in the County's Drug Drop Box Program for the disposal of unwanted medications. This program is part of the battle against the heroin epidemic in that the abuse of prescription painkillers can lead to heroin usage. Disposing of expired, unused or unwanted medicines to collection sites such as this, will not only help counter prescription drug abuse, one of the fastest growing drug problems in the U.S., but is the safest and most environmentally protective way to dispose of unused medication. The box has been placed in the lobby of city hall, to the left of the reception window. It is available 24 hours a day, 7 days a week for anyone to dispose of unwanted prescription and over- the-counter pills and patches. No needles, lances or liquids will be accepted.